He’s been a policeman, a footballer, and a switchboard operator. He’s performed in Les Misérables and chaperoned Desmond Tutu, and now, aged 79, Tom Mathers is one of Hull University Teaching Hospitals NHS Trust’s oldest volunteers. Tom began volunteering on Ward 200, the Elderly Assessment Unit at Hull Royal Infirmary in the summer, joining some 450 other local people who give their time to help others. He comes into the unit several times each week for a few hours, to offer a smile, a chat and a listening ear to patients who are there at the time. As well as keeping older people occupied whilst in hospital, he also helps the ward staff by collecting comments from patients and relatives which can be used to improve the service. But Tom would argue he gets more out of his volunteering role than anyone. “I always start by saying ‘Hello, my name’s Tom and I’m a volunteer. You’ve no TV or radio, so I just wondered if you’d like a chat?’ and 95% respond positively. “I’ve met some very interesting and some very clever people in the short time I’ve been here, including a concert pianist and a former professional cyclist. I get a lot of pleasure from talking to people as they tell me about the things that interest them, and I learn a lot. “Often I’m older than the patients I’m talking to, so we’ll talk about things from the olden days; I’ll ask ‘do you remember dolly sticks? Washboards? Or only going in the front room on a Sunday?’ And the patients and their relatives are really appreciative as it brings back memories and helps them to pass the time. Tom began volunteering after losing his wife, but says he wishes he’d known about the opportunity much earlier. He has also survived cancer, and that’s part of the reason he considers our local NHS to be ‘world class’. “I have such a great depth of feeling for the NHS, it’s a world class service and the staff don’t get the recognition they deserve. “Ward 200 really typifies our caring NHS, the staff are wonderful and the atmosphere here says ‘don’t worry, we’re going to take care of you’; I tell that to all of the patients and their relatives who come in here. In the few short months he has been giving his time to the ward, he has become a firm favourite with staff and patients alike. 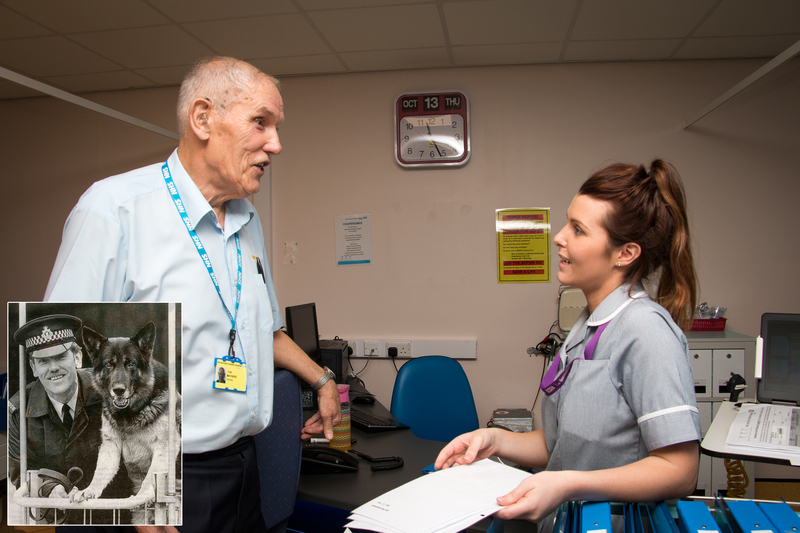 “Tom is a real asset to our ward, as he connects with our many of our patients in a way which only people from the same generation can. He’s a real character who helps to brighten up the day of many of those spending time on the ward, some of whom don’t have relatives or visitors and so the days can seem very long. Tom is one of a growing army of volunteers supporting patients, staff and visitors across both Castle Hill Hospital and Hull Royal Infirmary. Volunteering opportunities are available for people as young as 16 years of age through the Young Volunteers programme, with no upper age limit, and those giving their time can express a preference for the department they work in. For more information on volunteering opportunities with Hull University Teaching Hospitals NHS Trust, contact the Patient Experience Team on (01482) 674326 or 675189.